Thermal Imaging Camera Picture of man doing home inspection using a thermal camera which is showing the thermal image of a building. Disclaimer: If you purchase any products in this post, we may receive a small commission. We promote only the products which we test and recommend. Read our affiliate disclaimer here. It is not an easy task to choose the best thermal imaging cameras due to the number of choices put before you. But being a four-figure investment, you can't buy one just like that without any research. To help you buy the right thermographic cameras, our experts have reviewed 21 thermal heat cameras made by top companies, used them for over 48 hours and finally have come with the results of the tests we carried out. Here is the list of 10 Best Thermal imaging Infrared Cameras that are worth the money you pay and are the market leaders in this segment. What is IR Thermal Imaging Camera? Based on body heat, every object in the universe emits infrared energy and that emitted heat or infrared energy is taken as its signature of heat. This emitted energy increases based on the body heat of an object. A thermal imager often called Infrared Camera is basically a heat vision sensor which can detect very little differences in the temperature without any ambient light even in extreme darkness. The temperature camera receives the overall heat energy from the objects in the screen and produces an electronic image based on the collected temperature information. Other thermal devices like thermal scopes, thermal monoculars, thermal imaging goggles, and thermal binoculars are also working based on this technology. Leak in a airbus found by thermal imaging camera within minutes. Without this, you need to pull out tons of panels and floorboards before you find out the leak. A thermal image camera can detect each individual object in the scene and create different thermal images if there are any temperature abnormalities due to leakage in the objects or living beings hidden in the scene. These heat sensitive cameras are used to figure out the temperature differences and heat leaks in buildings and electronics. There are thermal imaging security cameras used in home and industries to ensure the safety. They are also used in army and hunting. What Are The Applications Of A Thermal Imaging Camera? What Are The Types Of Thermal Imaging Cameras? What Are The Criteria That Should Be Met By The Best Thermal Imaging Cameras? As already said thermal imaging cameras have been utilized in a variety of real-life applications. All the heat vision cameras are designed with the basic thermal imaging features and few special features based on the industry or application where they are going to serve. Therefore, here we listed the top 10 Best Thermal imaging Devices that can be used in electrical inspection, agriculture, home inspection, plumbing, vehicles, wildlife, hunting and many more. 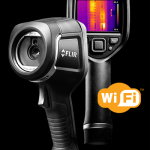 FLIR is one of the popular thermal device manufacturers. They have produced a series of FLIR thermal imaging camera models with basic FLIR’s thermal imaging technology and various high-tech features. FLIR TG165 Spot Thermal Camera is topmost recommended thermal device which fills the gap between the traditional FLIR thermal imaging cameras and single spot IR camera. This camera allows the user to see the heat and notify the place where to detect. This Flir TG165 has Flir’s unique Lepton micro thermal sensor to find the cold and hot spots and enable the thermal images and its information to be stored. Later, that can be used in final reports and given to customers. It’s simple usability and intuitive design need no special training to use. TG165 is a Class II thermal laser device that has 150mK as their thermal sensitivity and the frame refresh rate is 9 Hz. This thermal imager is available with an 8GB micro SD card that can store up to 75,000 images and USB cable for data transfer purposes. This rugged thermal imaging camera cost is less when compared to most of the other thermal devices offering the same features. Flir TG165 spot thermal camera has 24:1 as spot ratio. Flir TG165 thermal camera has dual laser targeting system to help you in aiming the problematic areas. 36 inches is the optimal length of this system. The temperature accuracy is high using this dual laser targeting system. Moreover, you have no camera to see the non-thermal contrast of an object or place what you are detecting. Unlike Flir C3, this Flir TG165 thermal imaging camera has a battery that stands for five hours during laser scanning and measuring. TG165 has the rough and design to withstand the drop from 6.6 feet. Here is a video shared by a Flir thermal camera user. It shows the difference between hot & cold tap water as seen through a thermal imaging camera. Though the Flir TG165 has an affordable price, it can have better image clarity (80x60) and wide display for the money. Another one drawback we have seen on FLIR TG165 is that it has only 3 color palette selections such as iron, rainbow, and gray. Flir E4 is a compact and handy thermal imaging camera that has all basic features of thermal imaging with the best-built quality and it is one of the best cheap thermal imaging camera available. With 3 inch display, this thermal vision camera has four resolution options ranges from 80×60 IR pixels to 320 x 240. Although the resolution does not meet the RESNET standards, it clearly detects the serious real-life problems like insulation gaps, window and door leaks, and overheating electronics. Unlike Flir E8, this Flir E4 save the thermal images in JPG images so they don’t have any radiometric information. Still, the images are useful to find basic heat issues. E4 has fixed with its focus point so you will adjust the distance between you and your object in order to get the clear images. The camera is equipped with a lens that is designed to handle the possible largest focus distance. This thermal heat camera has two basic measurement modes such as center spot and area box. This camera has all intuitive menu controls and one hand operation enabled design. This Flir E4 has designed with all other basic features of Flir in affordable price and engineered to withstand the falls up to 6.6 feet. The basic Flir’s rugged design helps to use it on all rough and tough areas. Flir E4 is the best option for those who need a thermal camera with typical thermal imaging and required features at a limited budget. Flir E4 only provides images in JPG format that don't have any radiometric information. And also this thermal heat camera does not meet the RESNET standards. Flir C2 is completely a pocket-sized thermal camera with essential features that every professional and homeowner need. This version of Flir works well at detecting plumbing issues, leakages, and structural errors. It was equipped with a 3-inch wide vibrant screen and LED spotlight to detect the problematic areas. C2 copulated with Flir tools reporting software to provide the best performance. Any thermal imaging camera with Wi-fi capability is best for users who will need thermal imaging often. 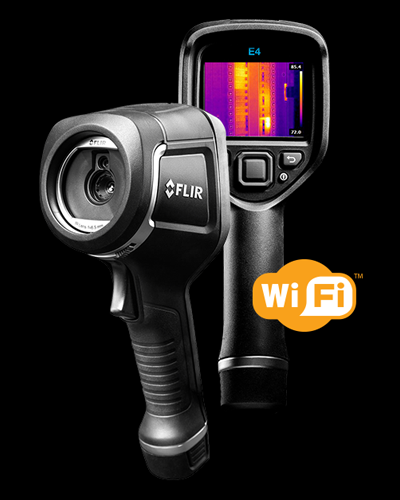 As like other models of Flir, this C2 also has updated with Wi-fi capability to make the data transfer easy and fast. It can capture up to 500 radiometric images with temperature information. The thermal sensor used in this thermal camera is capable of producing images in 4800 pixels. C2 features the MSX image enhancement that adds important information to the IR image in real time from the visible light camera. So at the end of the day, you will get the undiluted thermal image with entire visible light information which clearly shows you where the heat issue is. 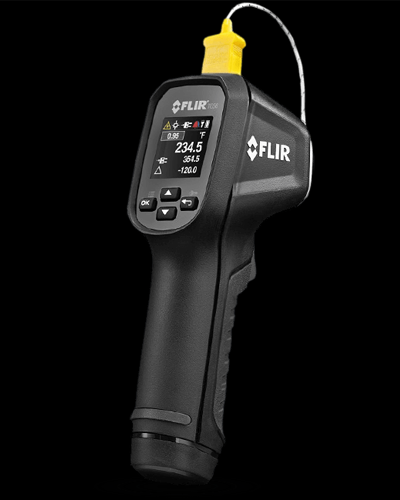 The high sensitivity detector in Flir C2 heat image camera captures the exact heat loss or gain and thermal patterns of the problematic places where you need to detect the leaks and overheating. Its 45-degree field of view is seen as one of the advantages of this thermal device. The thermal sensitivity of this thermal imager is 10C. There is no option for you to record video. The video recording option needed in analyzing, identifying, and preparing the convincing report if you have serious problems. Fluke TIS20 has powerful and some advanced features than their previous models. Fluke TIS20 and TIS10 are affordable options for buyers who shopping on a limited budget and need for specific features in great quality. The point and shoot method of Fluke's handles the thermal imaging in a better way. 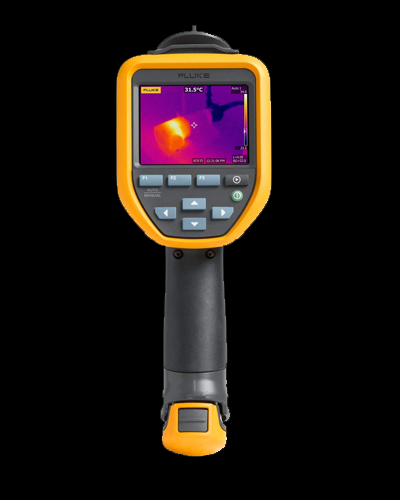 Fluke IR fusion technology in this thermal camera combines IR images and digital images into one to get sharp images. These digital and infrared images can be analyzed in both on and off the camera using the unique feature of Fluke, pixel-for-pixel alignment. The problems that are unidentified during the thermal inspection can be seen and address clearly through this IR fusion technology. 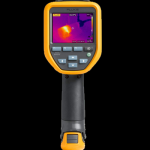 This Fluke’s model uses 120×90 resolution (in total 10,800 pixels) thermal sensor and 3.5 inch LCD screen 320×240 resolution. The images of Fluke thermal camera images are still ranking best among various high-resolution thermal sensors screen as it has 5 mp camera and uses the 10,800pixels sensor. The thermal images are directly stored on Fluke Cloud Storage using the Wi-Fi capability. Fluke thermal imaging camera of this version has an LED charge level indicator for the battery to avoid the sudden power loss. The frame rate of this heat image camera is 9 HZ. It has built with one-handed design, intuitive menu, and rugged outlook to withstand the drop rate. Even Fluke TIS20 offer 3 different IR-fusion blending modes on their camera for the better reference of IR images; the clarity level is less than the basic Flir MSX. 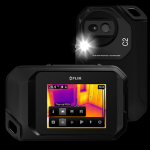 Flir E8 thermal imaging camera is a handheld camera that has a rugged design to work great in both home inspections and construction inspections. 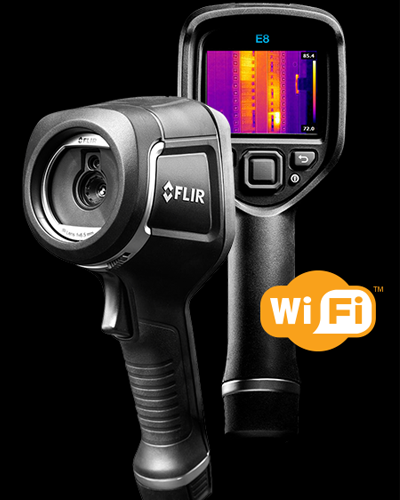 The FLIR E8 provides sharp images with 320 x 240 resolutions and exceeds the RESNET standards. Flir E8 capable of storing Thermal, Visual and MSX enhanced images in a single trigger. JPEG images shoot by this camera can store radiometric information on almost 500 images. E8 also offers picture-in-picture image processing. The multiple user-defined modes are the center spot, area box, auto hot or auto cold spots. It also has the high-end microbolometer that is essential for any thermal imaging device. E8 heat sensitivity camera has a large field of view on 3 inches screen. The minute temperature and leak detection make this Flir E8 camera perfect in electrical inspection and leak detection. It has a focus-free lens and intuitive button menu navigation to display settings for easy operation. It also has a Li-ion rechargeable battery which lasts 4 hours for typical use. The drop rate of this Flir E8 thermal camera is 2meters. 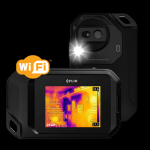 Like Flir C3, E8 also have Wi-fi capability which you can use with the network or peer-to-peer setup and it is free from location controls so you can make the faster transactions. The ranking of Flir E8 would be high if it was equipped with a touchscreen display. Flir C3 Pocket sized camera is next to C2 in the line of Flir's thermal imaging cameras. 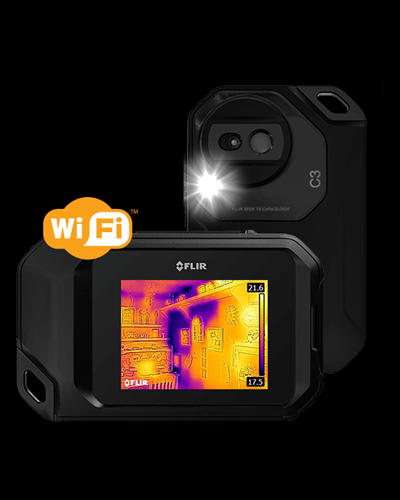 Flir C3 thermal imager has developed with the same functionalities as C2 but with the addition of Wi-fi option to transfer thermal images and videos between mobile phones and tablets. C3 works great in the field of building inspection by checking the electrical repairs, water leakage, and moisture intrusions. The C3 model has all features that are needed by the field professionals. The MSX image enhancement feature, picture-in-picture option, various user-adjustable measurements modes, and high resolutions sensor are some of the advanced features of Flir C3. Even FLir C3 is thermal heat vision camera, with the pocket-sized design it can be taken and used anywhere. Flir C3 provides a maximum of 500 radiometric images and the image quality of C3 is up to 4800 pixels. This heat sensor camera has a 3inches touchscreen display. It has a microbolometer with a sensor up to 320×240 which can capture images that are 60feet away maximum. So the temperature measurement range is from 14°F to 302°F. That one feature which makes C3 stand different from C2 is its wireless capability. This C3 can connect to mobile phones and tablet wirelessly with the help of free Flir Mobile App. This feature helps the building inspectors to share the details with officials and customers. Flir C3 heat sensitive camera has Hot SPot or Cold Spot capability to measure the area of interest quickly. The minimum or maximum temperature and the spotmeter are displayed by this Flir C3 thermal camera. This feature helps to identify the hottest or coldest areas immediately. The battery used in this Flir C3 thermal camera needed to be replaced before a year. Seek Thermal Reveal is an entry-level thermal imaging device that has both thermal imaging technology and the LED lighting in one single device. This thermal imaging camera is created with the idea of using it in fields of real life such as construction, building, capturing the pets at dark. The rubbered surface and ergonomic grip with the angled head makes the process of targeting and seeing screen easier. 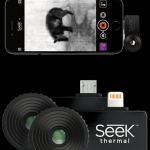 Seek reveal thermal camera has powered by a battery that can last up to 10 hours. This thermal imaging camera offers 36-degree wide field of view to scans any rooms and places for problems. Seek thermal imager is also equipped with the thermal sensor of 206 x 156 pixels resolution. The 300 lumens LED light to avoid the need of using torches and light in the low light areas. With the single touch Seek thermal reveal camera can detect the objects and measures the heat up to 500 feet. The auto-detection and auto-emission modes in this thermal imaging camera help in areas where most of the objects emitting the same amount of heat. Seek reveal thermal device can be operated with one-hand which has user-defined controls with intuitive menu navigation structure to set the settings and for more advanced features. The thermal images acquired by this heat sensitive camera will be directly stored to the SD card used in the thermal imager. This version of Seek thermal reveal thermal imaging camera did not have any official details about its drop survive range. Based on our customer reviews it shows that Seek reveal has less drop resistance. So when we consider seek vs flir on this particular feature, surely flir wins. 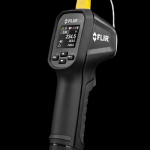 This Flir TG56 is one of the best infrared thermometers to work with various applications such as ventilation, motors, bearings, transformers, fuses, diagnosing AC units, fuses, bad electrical connections, and other applications that need temperature details which can be handled by Flir TG56. This Flir TG56 IR thermometer is best to work with various applications such as ventilation, motors, bearings, transformers, fuses, diagnosing AC units, fuses, bad electrical connections, and other applications that need temperature details which can be handled by Flir TG56. Flir TG56 thermal heat camera has developed with work lights and laser pointers. Even though the laser pointers are familiar with most of the Infrared thermal cameras in recent time, the work light is quite unique and helps to use it in dark places. This Flir TG56 heat sensitive camera also equipped with customized low and high alarms and adjustable emissivity. Based on the type of surface for what you are measuring, the emissivity is adjusted. The user-defined alarm system is helpful if you have fixed outsets to keep. TG56 is one-hand operated thermal imager with premium quality industrial design and rugged outer shell. The drop resistance of TG56 measures up to almost 10 feet(approximately 3 meters) and have no-tool-needed simple battery placement. This Flir thermal imaging camera offers non-contact surface temperature readings to quickly take the measurements in out of reach places. With 30:1 distance-to-spot ratio, this heat image camera measures the area of interest from an applicable distance. The New mode options in this heat vision camera enable you to see the last two radiation details with current reading together. The TG56 sensor camera has a color screen and graphical menu structure for easy navigation and better visibility. Flir TG6 thermal camera has a small display and so they are capable of producing thermal images in less resolution. If you want a budget option to the thermal imaging camera and want to covert your mobile phone into the thermal camera then this Seek Thermal Imager will be a good choice. The Seek Compact XR thermal imager is an add-on thermal device for mobile phones (Android and iOS) built with the thermal technology that has been using in military and field professionals and has the high-temperature range to capture the quality thermal images from the distance that is multiple of the regular thermal camera. Seek thermal imaging camera uses are mostly in real-world. These thermal cameras accurately detect the water and heat leaks inside the pipes, heat loss and gain around doors and windows. The cold and hot spots of grill and griddles also can be checked. You can use this thermal imager to find irregular activities of unwelcomed animals and humans at your lawn or backyard. Basic thermal imaging models offering capture range of thermal images from up to 1000 feet away but the Seek XR thermal heat camera do it from up to 1800 feet away. This is highly leading one among other thermal imagers for android. 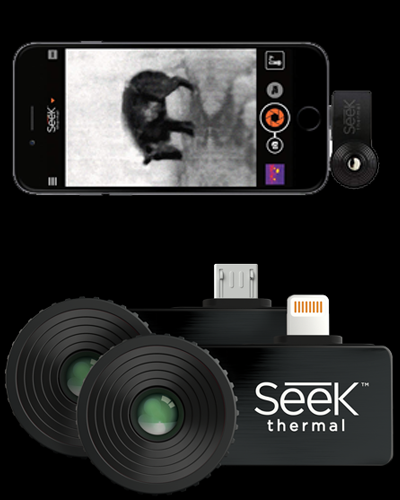 the thermal sensor used in the seek XR thermal imager offers the thermal image resolution 206×156 pixels which is the higher resolution rate than any other thermal imaging camera for Android and iOS. This Seek thermal imaging camera doesn’t need any batteries as they can be powered by the charging port of the mobile phone. Anyone can create an optimal image that is absolutely matched to thermal image what you need to capture with the help of threshold settings of this XR thermal imager. The threshold settings emit the temperature that exceeds or below the certain point. This compact XR thermal imager comes up with the waterproof carry case for the camera to protect from any unexpected fall. You can get a more detailed review of Seek Thermal Imaging Camera here. Though The Seek XR thermal imager has high distance capability, lack of a digital camera that could create the overlaid images, detailed images with multiple modes are some strong complaints about Seek XR. Flir One Pro is one of the easiest thermal imagers to use with both iOS and Android and it is another one cost-effective alternative to the thermal camera. They work the same as the thermal imaging camera but on your mobile phones. You can get most of the installation and further instructions about Flir one pro from online also. Unlike most of the top rated thermal imagers which are equipped with micro USB port, the FLIR One Pro is using the new USB Type-C which is useful in twisting the camera in all desired directions. This self-contained dongle thermal imaging camera is benefiting the plumbers with MSX technology that is best for improving the image details. This technology provides clear images that make the job of plumbers so easy. Flir One App is one of the interactive thermal imaging camera apps that makes the installation part quick and easier for their customers. The app has created with the intuitive menu structure and offers better performance in images, video, and recording sequences. This rugged premium quality thermal sensor has 5.9 inches as their falls survive measure and build with a tough quality protective case. The thermal sensitivity of this Flir One Pro thermal camera is up to 150mK. The FLIR One Pro thermal vision camera provides 1440×1080 visual resolution with 160 x 120 thermal resolution. It also has VividLR image processing to produce sharp and crystal clear thermal images. The other way to use thermal imaging on the phone is to use thermal imaging phones. Yes, thermal imaging phone exist. If you look for the one, Caterpillar CAT Thermal Imaging Smartphone is one best thermal imaging phone in the market now. 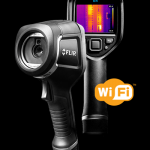 We can see the most online complaints against this Flir One Pro thermal imager are about its Dongle’s incompatibility with most Android mobile phones and short battery life. Before choosing the cameras you should have complete knowledge about how to use a thermal camera properly and what are all the other similar technologies available in the market. Difference between the pictures taken by Normal Camera and Thermal Camera. Difference between Infrared Camera and Thermal Camera pictures. The working principle of Thermal Imaging Camera. Man caught on Thermal Camera. Thermal Image of a Woman. Bats clicked by Thermal Camera. Dog's funny pose to Thermal Camera. Using a thermal imaging camera can provide you with numerous applications in various fields. Below are some of the uses of thermal imaging camera. The capabilities and features of thermal imaging cameras help the building inspectors to carry out the most of the building and construction analysis quickly without damaging the environment unlike the other meters such as moisture meter which make slight damage to the materials in order to get the clear measurements. Most of the people started using thermal imaging for a home inspection also because they are effective and help to identify the excess heat loss and gain inside the rooms and garages. The water flow in the plumbing system also detected by these thermal cameras. USGS (United States Geological Survey) uses thermal imaging cameras for locating groundwater as per this report. The thermal imaging cameras do wonder in detecting heat problems and electrical deficiencies. With the thermal camera, you can detect the component damage and excessive heat or cold in the electrical systems that are used from simple domestic purposes to complicated industrial systems. Thermal imaging cameras for PCB inspection helps you find where the hotspot in the circuit board and you can use remote to control certain types of cameras during an automated inspection. Thermal imaging devices are used in life-saving activities like firefighting. The thermal camera can help the firefighter to see through darkness and detect the high flaming fire in a place. They used this camera to detect the body temperature of the trapped person in dark rooms or areas. Thermal imaging camera for firefighters can be mounted to the helmet of firefighters to see the objects in thermal imaging without the help of hands. Thermal imaging camera for wildlife enables the user to see through the darkness, other climatic changes, and natural camouflage of animals to find and follow them without disturbing their environment. Thermal imaging is effective for hunting and the thermal cameras are dedicated to outdoor uses from hunting an animal to just tracking and viewing them in dark outdoors and these cameras also used to check for the problems in wild areas. For Example NASA has developed a wide area thermal imaging system to identify forest fires from a great distance with 100% accuracy. When we talk about thermal imaging for animals we can’t ignore Equine thermal imaging. These Equine thermal imaging devices are used to find injury parts and how deep the injury is in the horse. This is one of the best cost effective devices used for Equine health and treatments. Thermal imaging camera for the drone is one of the powerful tools that can be used in rescue operations, wildlife, fire service and for an aerial view of any darkest places. Thermal drones with a vision camera are also working as same as a usual thermal camera like detecting the objects with their heat energy or radiation. US national library for medicine uses thermal cameras in the reconstruction of lower limb after skin cancer surgery. 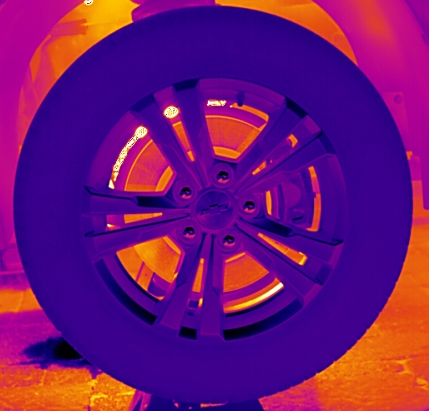 Some of the other applications of thermal imaging cameras are detecting the heating parts of complex mechanical devices, finding heat loss or gain in the skin, veins and other body parts of animals to treat them, doing non-contact temperature analysis of confusing electrical tools and machinery, and helping security and police officers to trap and find the criminals in critical climatic conditions. You have many valuable thermal imaging cameras within $1000 whereas you also have the thermal cameras that offer basic thermal imaging features for as low as $250. The thermal imaging add-ons for mobile phones are available from $100 to maximum of $500. 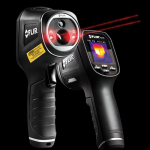 The best thermal imaging camera brands such as Seek, Flir, Fluke, and Dewalt are pricing up to $3000. The thermal imaging cameras are priced according to the features they come with. Apart from the basic features such as the temperature range and sensitivity, thermal imaging camera cost varies with respect to the infrared resolution, multiple modes, touch screen display, battery life and other advanced special features they have equipped with. Based on the cost of thermal imaging camera you can divide the brands into two classes: Thermal cameras with many additional features and a wide range of benefits that costs high and those cameras that are built with basic thermal imaging features that cost less. Below are some of the advantages of owning and renting a thermal camera. The most common reason why people renting a camera is “It’s cheaper”. If you have a limited budget and will need a camera for very particular uses then you can rent a camera from the best Renting companies. The rented thermal camera offers you the same qualities and features what an owning one will provide but for a short period. Another advantage of renting is you can try out different brands and products with which you will get the experience and knowledge about the thermal camera and what are all the features you are requiring. This will helps you when you planned to own a thermal camera. If you are a frequent user of the thermal camera for your regular home inspections and any repair jobs, you could own a camera instead of renting it adequately. Owning a thermal camera will help in any emergency situations. Imagine that you feel sudden heat increase in your darkened basement and you are not sure what would be the cause. In this case, you can’t take the risk of getting into the basement only with a torch, here you will need a thermal camera at least to have the guts to look into. So these are all the advantages of renting and owning a camera. You have to decide based on how often you will need it and how much you can afford. The thermal imaging cameras are classified into two different categories depending upon the temperature they require for working; the thermal cameras with cooled infrared detectors and the uncooled infrared detectors. The difference between the cooled and uncooled thermal imaging is explained here. This picture shows very fast capture result of a tire rotating at 20mph captured by the cooled detector. The cooled thermal imaging cameras require cold temperature for operation. The temperature can be 4K or below in order to get benefitted with the infrared sensitivity. Using this type of camera will offer you crisp and clear images with great quality. However, they are a bit expensive and heavy. This picture proves uncooled detector has very low capture rate when capturing the rotating tire. The uncooled detectors require an environment with the room temperature to perform the operation. They do not necessitate additional equipment for working. The quality of the images produced by these detectors is low when compared to the cooled detectors images. But, these are cheaper than the cooled detectors. Irrespective of their type, both the cameras use a single color channel for visualization. They reproduce the object with different shades of colors to denote the temperature of the particular object or body. They represent the warmest parts of the object with bright colors, usually white. Those areas that are not hot are represented with yellow and red colors. Further, the areas with the coolest temperatures are represented in the darker color shades particularly black. It also displays the color scale depending on a particular temperature. You can check how these detectors used differently on thermal heat cameras at cooled thermal imager vs uncooled thermal imager. As there are various features and capacities built with a thermal imaging camera are varying brand to brand, selecting a particular camera becomes a complex task. However, you have to look into some basic features in any of thermal camera before choosing for any purpose. 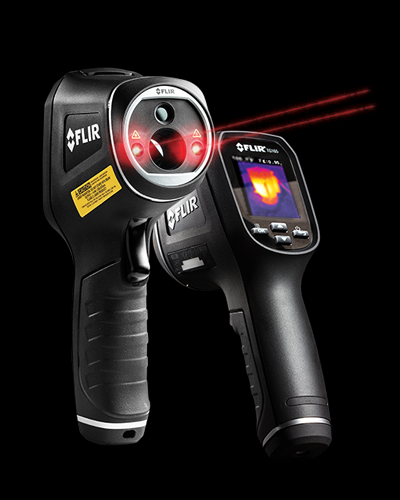 The primary work of thermal imagers is to produce the thermal image of a suspected object. Most of the thermal cameras from a few years back have come with a feature of providing only the visual images which can help in identifying the defect in a particular location clearly. But now the thermal cameras have comprised of a unique mode called the fusion mode, with which both the thermal and the visual images can be obtained and it will help in identifying the problem and get the clear temperature information about it. As the thermal imaging cameras are used to identify the defect or fault in a particular area, having a clarified picture with quality is essential. The resolution is determined with the help of the Focal Array Plane sensors present in the thermal camera that are not available in the digital cameras and is measured in pixels. Purchasing a thermal imager with low resolution will result in a visual image which looks similar to the one from the digital cameras. Most of the thermal imagers offer a picture resolution capacity of 120×120 or 140 × 140 in terms of pixels. The best thermal imager will offer a resolution of 180×180 pixels thereby providing accurate images which are useful for detecting even the minute defects. Most of the cameras come with a screen size of about 3 inches which is good but the camera that has a screen size ranging between 5- 7 inches in size and are highly capable of displaying images with the higher quality. Higher the screen size, greater the accuracy and enables easy identification of the problems and defects. We recommend screen display size no smaller than 3 inches. The next important feature of the display is the refresh rate. In general, the thermal imagers come with a refresh rate of 9 Hz and 60 Hz. Choosing the 9 Hz thermal camera is not a bad idea though the thermal camera which comprises of the 60Hz refresh rate is the best option as it enables proper focus. The thermal imaging cameras, with their infrared detector arrays are capable of offering accuracy with temperature sensitivity up to 0.1°C which is useful in detecting more accurate information. However, thermal imagers with the -20°C to 350°C temperature sensitivity and delivers precise measurements are considered extraordinary. Usually, the cameras can be operated with the help of the buttons and triggers they are built with. A user can navigate through those menu buttons to the required function or operation they wish to perform. The normal cameras may constitute only a few buttons and make the functioning get complex, whereas the best thermal cameras will constitute of several buttons with an intuitive menu, each of which is coded to perform a specific operation and are capable of navigating easily to the desired functions. The capacity of the battery to hold the power, as well as the availability of the spare battery, is quite essential criteria that have to be considered before purchasing. A thermal imager’s battery should be easily removable and replaceable when it runs out of power. We would not recommend going with thermal cameras with inbuilt batteries that cannot be removed and result in depending upon the power cord or circuit. When the lifetime of the battery ends, it has to be sent to the service shop and be checked for the availability of the replacement. But, the best thermal heat camera will have the removable Lithium-Ion battery and is readily available for replacement and holds the power for a maximum of 5 hours. Thermal heat cameras, regardless of the field they are used in, has to be light in weight and compact to be held in a single hand. Only then, the user will be capable of using it for a longer period of time. Further, the cameras should also come with a dust resistant cover and should have an exterior that is made of materials that offer grip in order to hold it in continuous working hours. The format that the image gets stored in the camera has to be considered while purchasing the camera. Generally, the thermal imaging cameras use two types of image formats; JPEG and BMP. The BMP image formats will strip down the temperature information to preserve them and for sharing separately. In the cases of purchasing a camera with a BMP image format, you will have to face compatibility issues as most of them require software to convert them into the readable form. This will make the process of sharing to become complex and tedious. But, those with the JPEG format are compatible with almost all the devices as it can be transferred and shared easily when at the workplace itself. When in work, you will require downloading more and more images of visual, thermal and fusion types. The best thermal imaging camera with the higher resolution obviously consumes more space to be stored in the camera which will, in turn, hang the camera when the memory gets filled. This will result in cleaning up space often. But with using a camera that has more than enough memory for storage will reduce the strain of deleting the images often to create space. The thermal imagers should be capable of producing images under any lighting conditions so as to be the best product. In the case of low light or darker areas, using a camera without proper vision will not help in identifying the defects properly. So, the best thermal imaging camera brands have come up with the option of including the thermal illuminator light which will help in providing images with picture clarity. The thermal imaging cameras are such devices that use thermal imaging technology to visualize the defects in the pile systems, wiring, or any other places. They have a wide range of applications in almost every field. Thermal imagers work with the help of the detectors that are built with it and with respect to which the temperature they are capable of working with depends on upon. When purchasing a thermal image camera for usage, you have to consider all the above factors and choose the one that has the most reliable qualities. Consider purchasing a product only according to your needs and necessities which will prevent you from spending extra bucks. What makes thermal imaging cameras useful? Unlike other cameras, the thermal imaging camera has the ability to differentiate the temperature range. So that it could be used to find the objects in hidden and dark places. It will produce a different thermal image with the temperature data for each object in the scene. 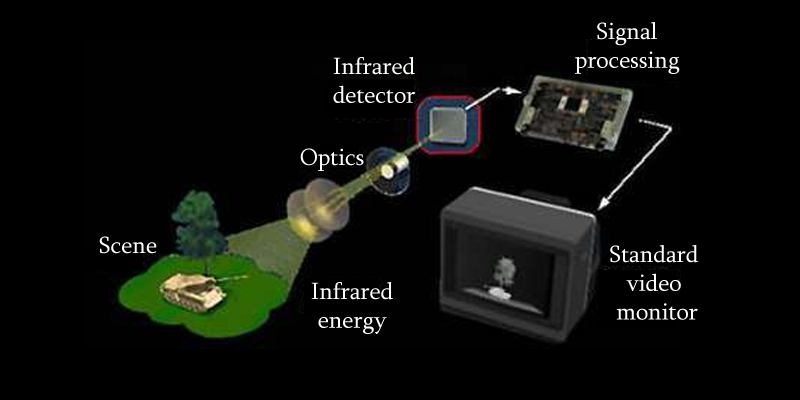 The IR radiation from an object is detected by the thermal cameras which work as the heat vision camera. In order to provide the temperature data as the human-readable form, these cameras convert the temperature of objects into different shades of color based on the level of hotness and coldness. Do thermal imaging cameras work in fire and thick smoke? Yes, thermal cameras have the capability to detect the objects in any climatic conditions such as rain, fog, darkness, smoke, and dust. So these cameras are served the security device for firefighters, security professionals, police officers, and law enforcement legal. Can a thermal imaging camera see through the wall? No, thermal cameras cannot see through walls but if the object causing the irregular heating condition of the wall, or heating wall, or cooling the wall, the thermal camera can allow you to see the indication of the problem creating object behind the wall. What is the best Thermal imaging camera for drone? Thermal drones are kind of aerial thermal devices which use vision imaging cameras to detect the heat of almost all objects and things and convert into thermal images and video with essential heat data. We would recommend FLIR Vue Pro R Thermal Imaging Camera as the best thermal imaging camera for drone. Next articleHow Effective Is Thermal Imaging For Hunting?